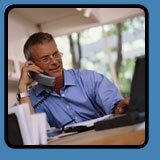 MyConference provides complete flexibility, letting you make conference calls anytime without a reservation. Conferencing when you need it . . . 24 hours a day, 7 days a week! Operator support at anytime during a call by dialing "* 0"
For more details about this exciting new service contact a member of your dedicated team here at the conferencing center or call our reservation number at 1-800-967-2005. Or click here to sign up for a MyConference account.